This bracelet brings to mind Old World elegance. 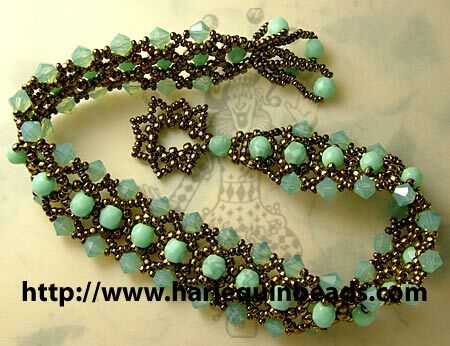 It is made with Swarovski’s Pacific Opal and Turquoise crystals, and steel grey charlotte beads. This bracelet is constructed with Swarovski Crystal bicone beads and Delica bead accents. 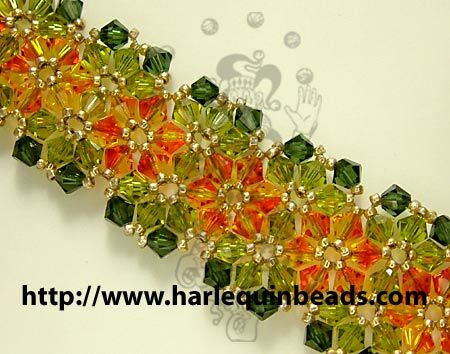 This exquisite bracelet shows the wonderful play of color that can be achieved with Swarovski crystal beads. Ana’s eye for detail and her fine craftsmanship are also well displayed. This delightfully elegant little crystal cocktail ring features Swarovski Beads, Seed beads and a variety of other beads. 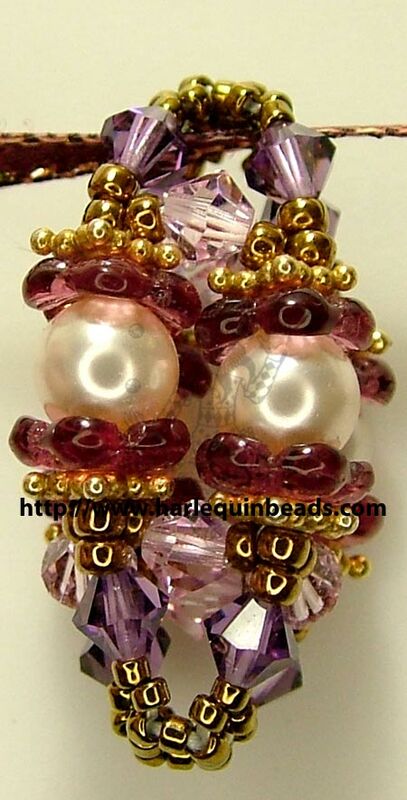 The centerpiece of this bead is pearls with fuchsia Czech glass and lavender Swarovski crystals featuring gold, bronze accents. Ana Vandagriff makes beautiful beaded beads using a variety of crystal and glass beads with silver and gold accents. She uses many different techniques to create an amazing collection of unique beads. Look for them in the gallery. 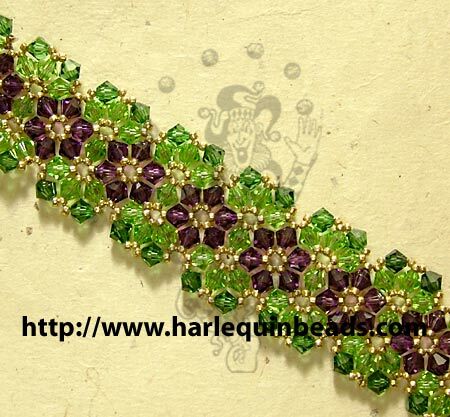 All article text and photos © Harlequin Beads & Jewelry unless otherwise noted. Text and photos may not be used without permession from Harlequin Beads & Jewelry. In Harlequin's bead library you will find information on the history of beads, how beads are made and how beads have been used throughout the world. Many articles include a bibliography to provide you with additional resources. Many of the beading books referenced are available at your local library. If there's a beading topic that you'd like to know more about, or you have ideas for our beading library - we'd love to hear from you. Email us your topic or idea and we'll pass your suggestions along to our writers. If you've written a beading article yourself that you feel would be a valuable addition to our bead library, we welcome your email, as well.